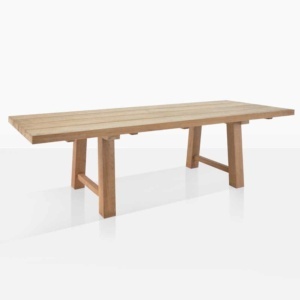 The trestle table is a classic statement piece equaled in its impact, only by it’s utilitarianism and stability. 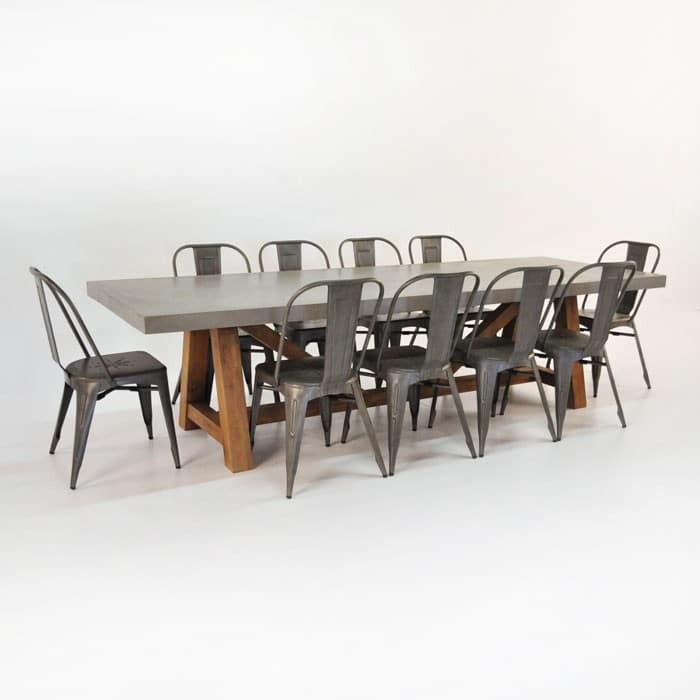 A seemingly timeless piece of dining furniture, the most contemporary versions of which are often made from reclaimed wood, to add to the rustic charm of the table. 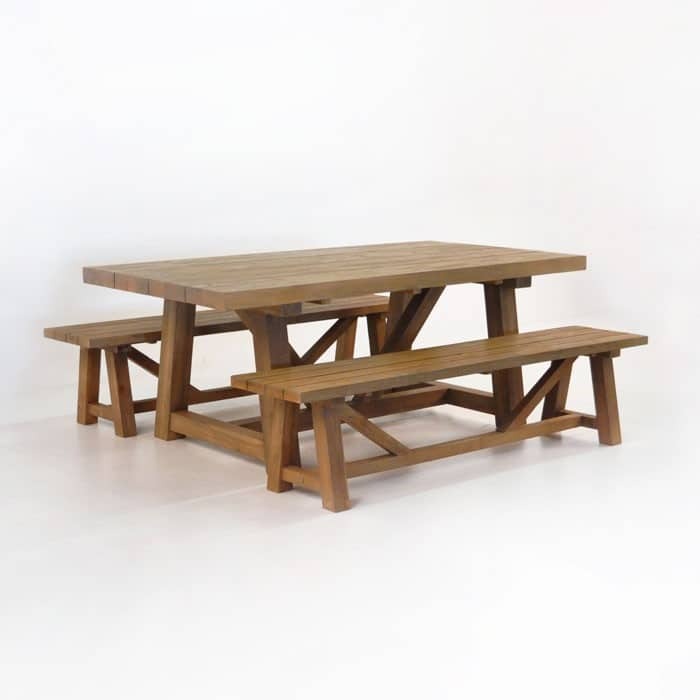 The rugged handsomeness of the trestle table and humble workhorse attitude are brought together gracefully by Design Warehouse in a variety of trestle style tables that work for virtually any space or situation. 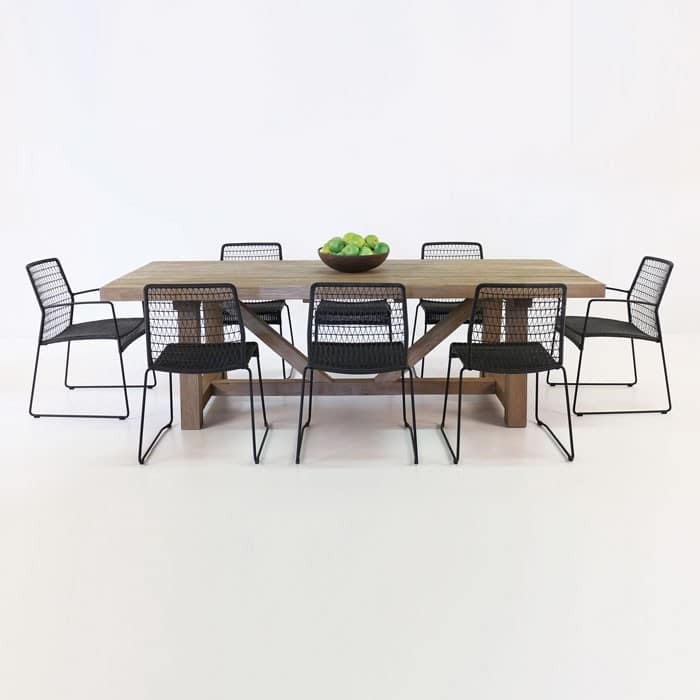 Design Warehouse offers more versions of the Trestle table than any single competitor in New Zealand. 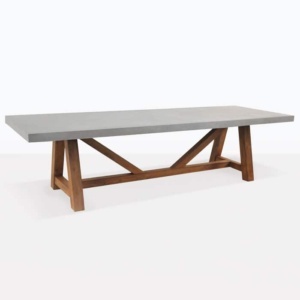 Reclaimed Teak, concrete topped, plank style: you name it, and Design Warehouse offers a unique trestle table to fit your needs. 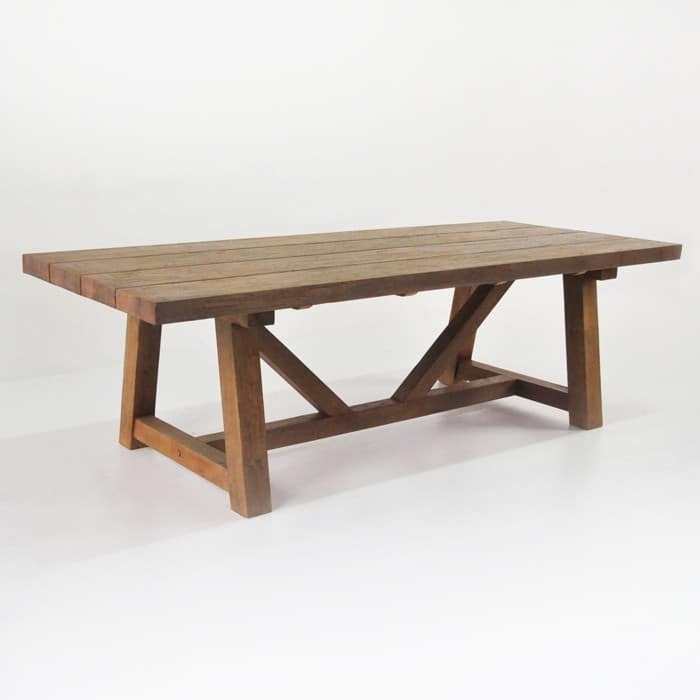 Currently Design Warehouse offers nine different trestle tables ranging from x-leg styles to more traditional trestles; salvaged wood and A-Grade teak. 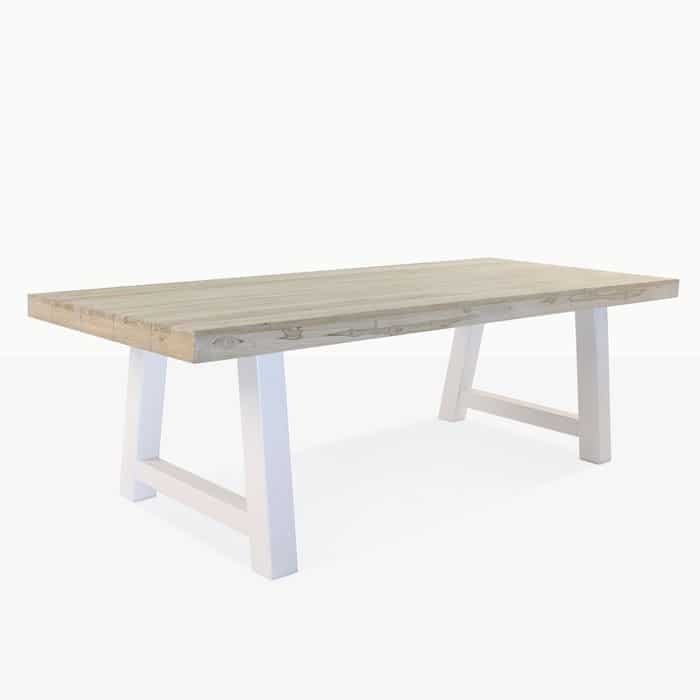 The humble trestle table has gotten a contemporary upgrade which allows it to work anywhere you need it to without losing that country feel and one-of-a kind look. 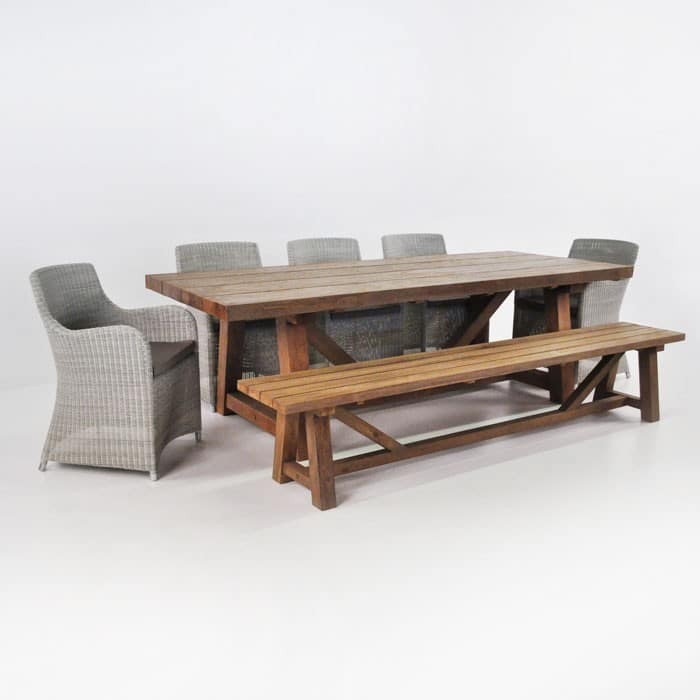 Strong but approachable, the trestle table is perfect for outdoor dining because it’s robust and usable, while also being attractive and functional. 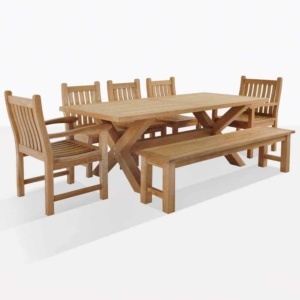 A trestle table can often be the perfect accompaniment to your other Outdoor Furniture. Our outdoor cross-leg or trestle tables seat from four to, in some cases, 12 diners, depending on the dining chairs and food service style. Trestle tables are simplistic in their functionality and build, but are sophisticated in their engineering to achieve this simple feel and long-lasting sturdiness. 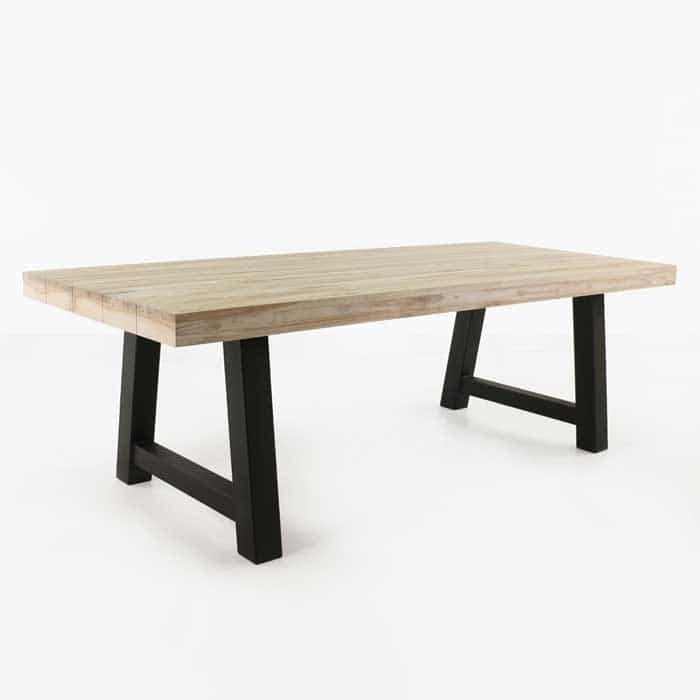 Trestle tables often have a distinctly monolithic feel to them, as if they were carved from a single piece of timber. Trestle supports with a table top combine to make a trestle dining table, with the more modern versions involving a firm connection between the two parts. 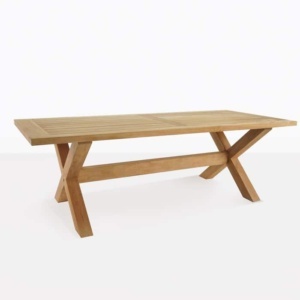 Essentially, a trestle table design was originated as a platform of legs, with a tabletop set on top of them. 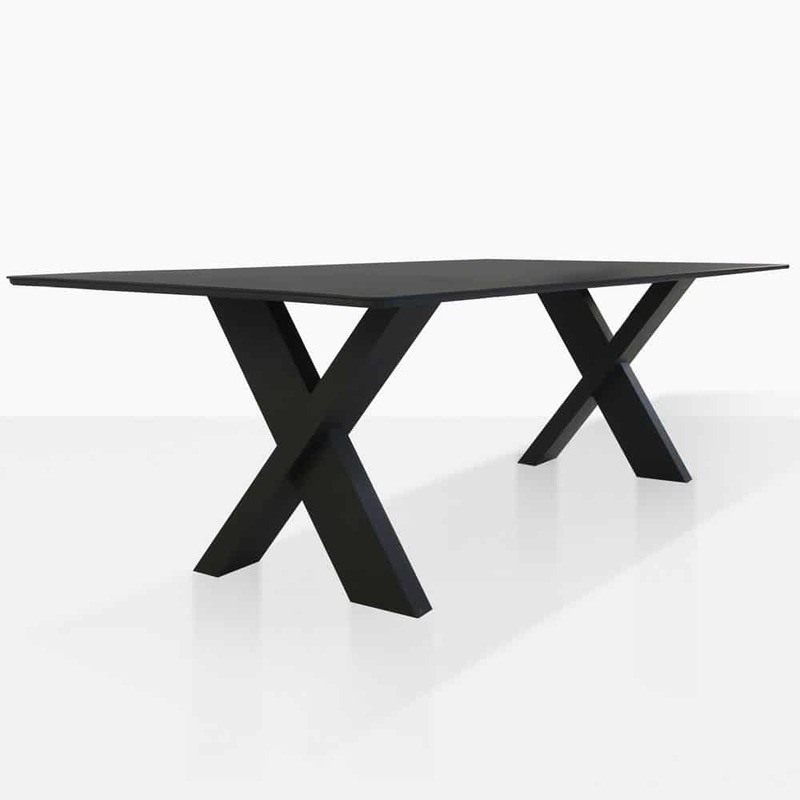 Sometimes this is referred to as a Sawbuck table, where the table legs are in the x-shape. Some might see the basic design in a makeshift table using sawhorses and planks of wood for impromptu projects. 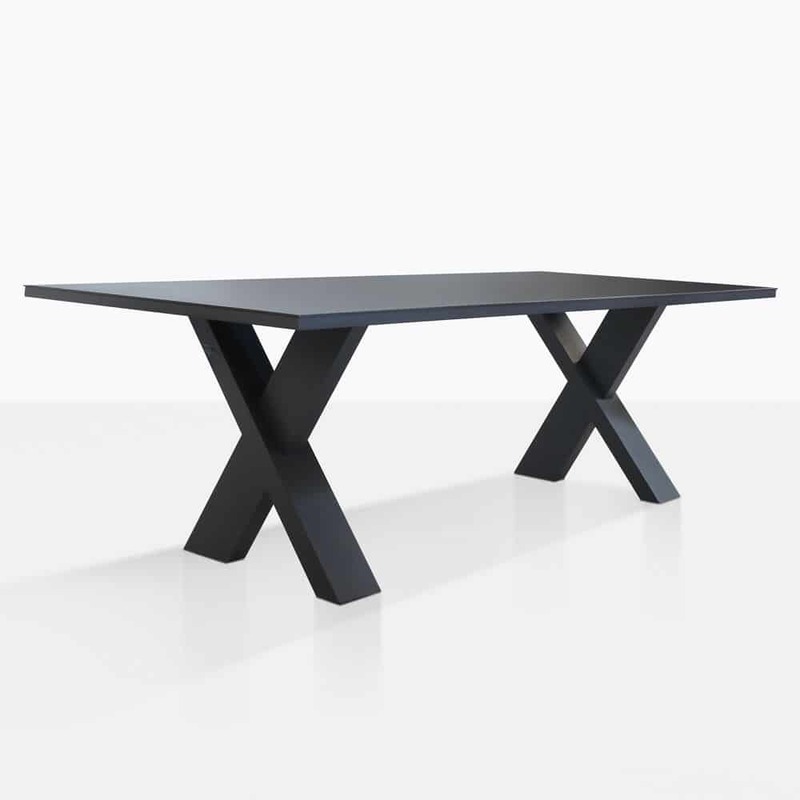 The trestle tables offered by Design Warehouse are anything but makeshift. 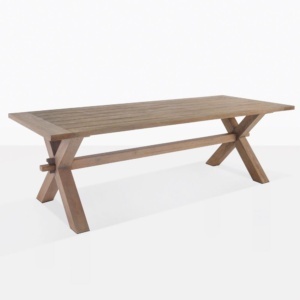 Design Warehouse is proud to offer the highest quality trestle tables in the industry, using only full solid wood and high quality hardware. 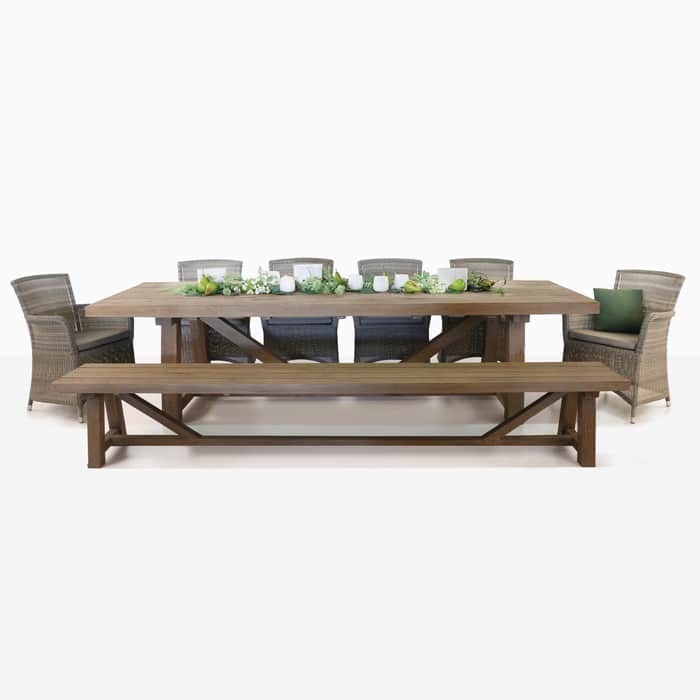 All of our outdoor Dining tables, including the trestle table offerings are made from the highest quality materials. When purchasing from Design Warehouse you can rest assured the product you will receive will be unparalleled by any of our competitors. 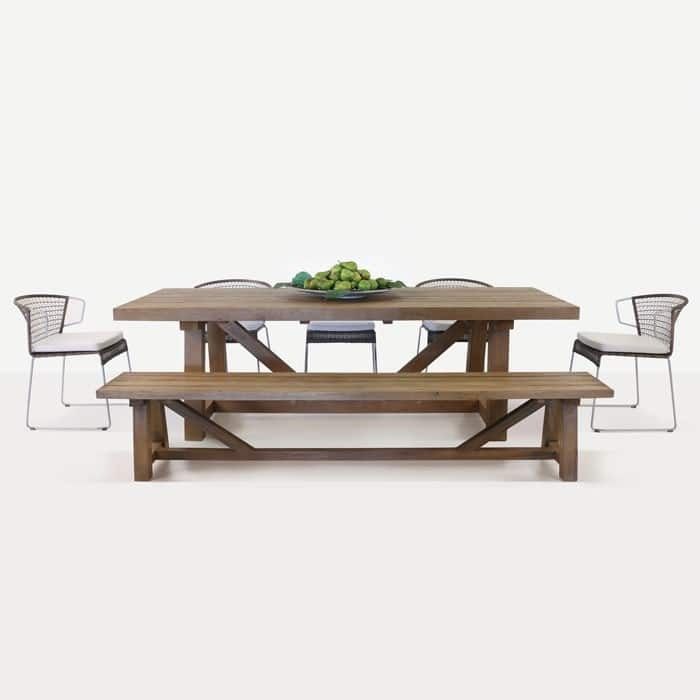 Looking For Other Dining Table Styles?